I've made it to Resolute Bay, but the journey up here was a small adventure itself. When I entered Calgary, my passport was flagged, and I had to go speak with an immigration agent who subsequently asked me all kinds of questions about my previous trips to Canada. (Having a name change on my passport only confuses matters more.) He wanted to know why I had been denied entry once back in 2001. I explained it was due to a scientific experiment paperwork misunderstanding that was cleared up the next day (although I think the real reason was because one member of our group was an Iraqi-American). The agent also wanted to know why I still had a piece of paper stapled to my passport from my 2-month 2005 stay in Vancouver for ISU. I said I just left it there because an immigration agent had put it there. He removed it. I didn’t dare tell him about my crossing into BC and Yukon without any passport whatsoever during the 1999 JIRP expedition. 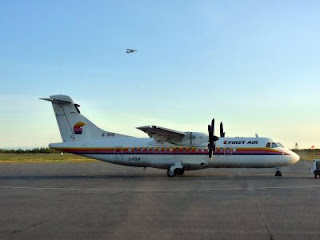 From Edmonton northward, one of the most major airlines is First Air, and I was really blown away by their service and amenities. Stepping on the 737 in Edmonton, I knew right away it was going to be an atypical flying experience. The space was simply cavernous with more leg and head room then I’ve ever seen on a passenger jet. Once the flight was underway, the flight attendant brought around hot towels, a selection of newspapers, complimentary wine, and served a full meal including two warm freshly-baked chocolate chip cookies and candy afterwards. This is the kind of service I would usually expect in first class or on long international flights, not an 80-minute flight between the small cities of Edmonton and Yellowknife. 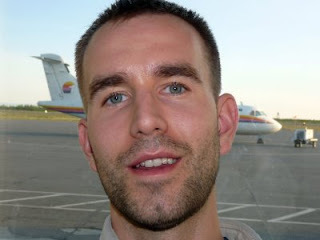 I am proud to count First Air as an FMARS sponsor, since they offered reduced airfare and cargo costs for our group. The picture here is the ATR-42 turboprop plane I took from Yellowknife to Resolute Bay. My arrival in Yellowknife went well enough at first. I retrieved my baggage without incident and found a secluded corner of the small airport where I could stretch out along the seats and sleep for the night. I had a 12-hour layover from 10pm to 10am and didn’t see the point in trying to find a hotel room in the town for such a short time. Plus, Yellowknife is in the midst of a big 75th anniversary celebration, and all of the hotels are booked or prohibitively expensive anyway. I pulled out my computer, organized my files, watched a slideshow of pictures of my son Henry, and started writing this journal entry. 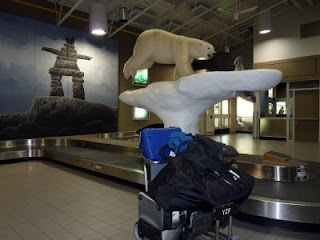 The picture here shows my luggage in the Yellowknife airport. I had just turned off the computer and taken off my shoes in preparation for sleep around 11:20pm when a security guard asked me to leave. Apparently, the airport is closed from 11:30pm-3:30am every night. Luckily, I had cold weather gear and a sleeping bag, so I thought I’d just rest on a bench outside the terminal for four hours. That plan would have been okay except for one thing: I wasn’t alone. There were a few thousand mosquitoes, and I was their all-you-can-eat buffet. You can see a photo of my sleeping bag outside the airport here. For over an hour, I tried toughing it out with the sleeping bag pulled over my head, but I was too hot and couldn’t breathe. I got out of the bag and paced along the sidewalk for about half an hour before a security guard took pity on me and invited me into his shack. I hung out there with him for around an hour and a half in the relatively mosquito-free environment. Each time he had to go do his security rounds, he made me wait outside, but thankfully he let me spray on some bug dope to keep the vampires away. When the guard returned from his 2am checks, he asked me if I had enough bug repellent and indicated that I should get my luggage and follow him. Another airport vagabond like myself had just shown up in a taxi. I guess the guard thought we belonged together, and inviting both of into his office wasn’t an option. 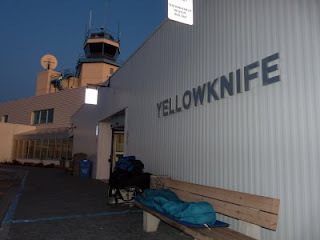 I spent an hour pacing back and forth to keep from freezing in the cold Yellowknife air. The other guy, obviously not from Hawaii like me, snored loudly on the bench wearing shorts and a light jacket. The day shift person arrived at 3:30 and let us in the airport. When I got inside, I resumed my position on the benches where I’d been interrupted four hours earlier and took a restless nap until it was time for my flight. 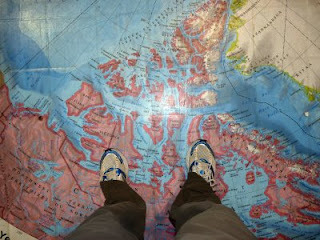 Here is a picture of me before leaving Yellowknife. 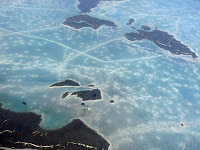 The flights to Cambridge Bay and then to Resolute Bay were very nice aboard one of First Air's ATR-42 turboprop planes. There were only 10 seats on the plane, with the rest of the space allotted for cargo. 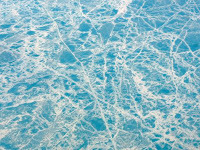 I was on the plane with 7 biologists from the University of Alberta who were headed up to a lake on the northern tip of Ellesmere Island. 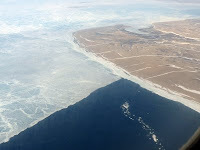 Below are a few pictures from the flight. 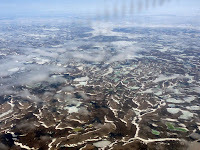 I'll be spending today and tomorrow exploring Resolute Bay and preparing for the FMARS flights up to Devon Island. I'm so excited to read all about your trip! Thanks for creating this journal.